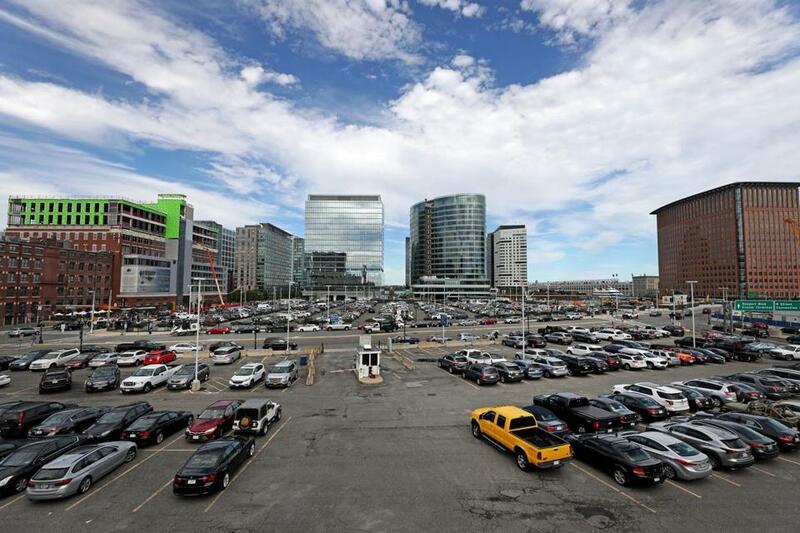 Lots in the Seaport District that are planned for redevelopment. The Seaport Performing Arts Center, part of the Seaport Square development, may be built where the parking lots exist now. Members of the city’s arts community have long dreamed that a performing arts center would one day rise in the Seaport District, a grand house for theater, dance, and music. As a version of that dream inches closer to reality, the new plan has triggered both excitement and many questions in the arts community, while drawing fire from some activists who say it would provide significantly less cultural space than an earlier City Hall-approved plan. WS Development, which owns the 12.5-acre Seaport Square site, is trying to rally support for a proposed complex of theaters that includes a 500-seat house and two smaller venues to accommodate audiences of 100 and 100-to-150 people. Principals at the firm say the proposed theaters — two of which would form the Seaport Performing Arts Center, or SeaPAC, with a third nearby — reflect the financial and physical realities of building in the Seaport while helping the city’s space-starved small and midsized performing arts groups. The arts community has welcomed the prospect of three new theaters, saying they would go a long way toward addressing pressing needs. Multiple arts leaders also expressed potential interest in operating the facilities, either as part of a consortium or as the sole operator. But while WS has not specified the project’s square footage, it would probably deliver less cultural space than a 2010 city-approved plan calling for a 200,000-square-foot performing arts center or “equivalent civic space” within the L-shaped mixed-use development, which stretches between Northern Avenue and Summer Street and had a different owner at the time. And although some arts leaders say Boston doesn’t need another large theater, the proposed complex only partially embraces suggestions made this year by the Boston Planning & Development Agency, which asked the developer to consider including an additional 800-seat theater, a flexible space for neighborhood artists, and an endowment to support their operations. WS has not committed to providing an endowment. Yanni Tsipis, WS’s senior vice president, Seaport, said the firm’s revised proposal caters to many of the needs identified in the city’s recent facilities assessment survey, which found a dearth of affordable rehearsal and performance spaces for small and midsized companies. For some neighborhood residents, however, the revised plan marks what they say is the latest in a series of Seaport developments in which civic and cultural space has taken a back seat to commercial interests. The arts community has been considerably more enthusiastic. Still, big questions remain. Among them: Who will operate the theaters? Should they be endowed to offset staffing and maintenance costs? And once they’re built, who will pay for the lights, seats, stage, and sound systems? WS’s Tsipis, who estimated the theaters wouldn’t be up and running for another three to four years, said it was too early to answer such questions. There is broad consensus among nonprofit performing arts groups that the theaters — if they are to offer affordable rates for presenters — must have an endowment. Josiah Spaulding, chief executive of the Boch Center, agreed. “It would be my hope that the developer, besides kicking in the land, would also help to support that project financially,” he said. Spaulding went further, suggesting that ownership of the new theaters might transfer to the city and be operated by a nonprofit. Meanwhile, a number of arts presenters imagined a consortium running the complex. Not everyone agreed an endowment was necessary. Don Law, president of Live Nation New England and co-owner of the Boston Opera House, said demand for the 500-seat theater would be great enough that an endowment might not be needed. Esther Nelson, general and artistic director for Boston Lyric Opera, said SeaPAC would not address the needs of her company, which seeks a space with around 1,500-seats. Tsipis, who has been meeting with various performing arts groups, said the firm was keeping an open mind.